Alpinestars is positioning themselves to be a one stop brand for all riding segments, and the SP-Z Drystar gloves take aim at the sport touring crowd. What is “sport touring”? We’re talking the guys that spend 8 hours in the saddle just to hit all the best roads along a route. It means touring at high speed, tackling the twisties, and requiring gear that provides more protection than your average fair-weather traveler. I think these gloves nail that perfectly. You’ll get two to three seasons out of these with full waterproofing. Obviously, if we’re talking winter weather, these fall short - so look elsewhere if you need to keep cruising when the winds of winter blow in, but for the rider who heads out even when the forecast looks bleak, the Alpinestars SP-Z Drystar Gloves will keep you dry. If a fully waterproof glove wasn’t functional enough, they threw their race-grade protection into this glove as well. CE Rated, knuckle protection, finger bridge, and padding for your palm. The goatskin palm provides great feel, while the rest of the glove is comprised of a blend of cowhide and synthetic leather. I love that they threw a “tech finger” into the mix, especially since this caters to commuters and long haul tourers where technology is an ever-increasing consideration. I do wish they put it in the thumb, though. 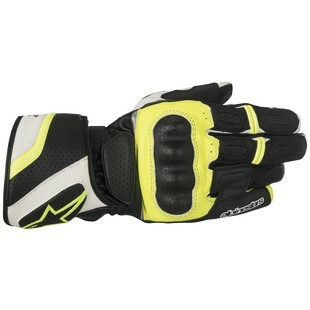 Available in four colors and six sizes, they are really going to capture a lot of different riders with this glove. If you want a full-length gauntlet, capable of keeping you dry, keeping you safe, and letting you interface with all your gadgets - the SP-Z is a winner for sure.